PREVIOUS: Use iFormBuilder as a data source – How can we help you today? Note: This article describes our old way of connecting to iFormbuilder. For the latest article, see NEW: Use iFormbuilder as a data source . 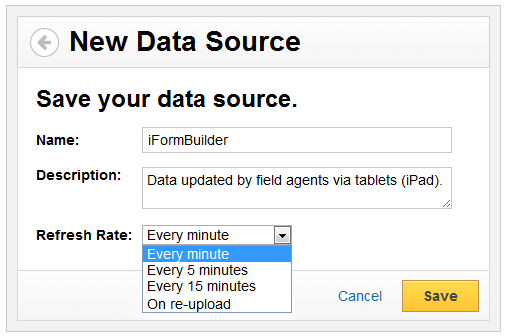 Learn how to use iFormBuilder as your data source. Retrieve iFormBuilder data using an API. iFormBuilder is a mobile data collection platform that is used by remote workers to update data files using mobile devices such as a tablet. For example, a real-estate agent can record the results of a showing or update a listing on-site, without having to return to the office and plug the data into their desktop computer. This means that iFormBuilder is a great way to simplify data collection for remote workers, reducing both the time and paper-work required to keep metrics up-to-date. Klipfolio lets you connect to your iFormBuilder data to create a data source and then build Klips for your dashboard. Since iFormBuilder is a web accessible resource, any data files uploaded will be automatically updated at a predetermined rate and any Klips using that data will also be updated. Check out iFormBuilder for yourself. 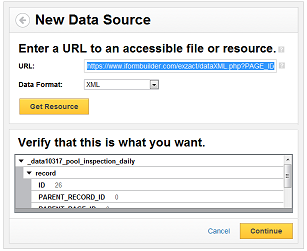 In order to create a data source using iFormBuilder, you will need to retrieve the Data Feed URL of the specific form you want to use (see the steps and image below). You can then use data enhancements in the URL to further refine the query – check out this documentation to learn more. It is also important to note that you will need to add your username and password to the end of the URL to access the data feed in Klipfolio. To do this, use the following format: “&USERNAME=xxxx&PASSWORD=xxxx”. Note: You will need to sign in to iFormBuilder in a separate browser window in order to retrieve the Data Feed URL. Click the Library link from your Klipfolio account. Click on the Set Up a New Data Source button. Log in to your iFormBuilder account. In the Data Feeds column, select an appropriate form in an appropriate data format (Excel, JSON, XML). You will be brought to the data view for that resource. Copy the URL from the browser window. Add valid credentials to the end of the URL using the following format: “&USERNAME=xxxx&PASSWORD=xxxx”. Click the Continue button to verify the correct data was retrieved. Provide a name, description, and refresh rate. The data source is saved and will now automatically refresh in the Library for future use.